On December 10th, Team Armstrong went on another team training hike. This time we hiked on Arizona Trail passage #19: The Superstition Wilderness; which is located near Roosevelt Lake. After leaving Sensei’s house at 5:30 am we arrived at the Roosevelt Lake Marina visitors center at approximately 7:45; after some quick prep work and sharing stories with the lady at the desk about Alligators and Big Foot being spotted on the trail, we started hiking at approximately 8:30 am. We hiked through 8 miles of some of the most beautiful scenery Arizona has to offer. We started in an cactus filled desert landscape overlooking Roosevelt Lake and hiked across several springs with beautiful oak trees, through dried rocky washes, and fought through what felt like a forest of thicket with 4 inch needles. 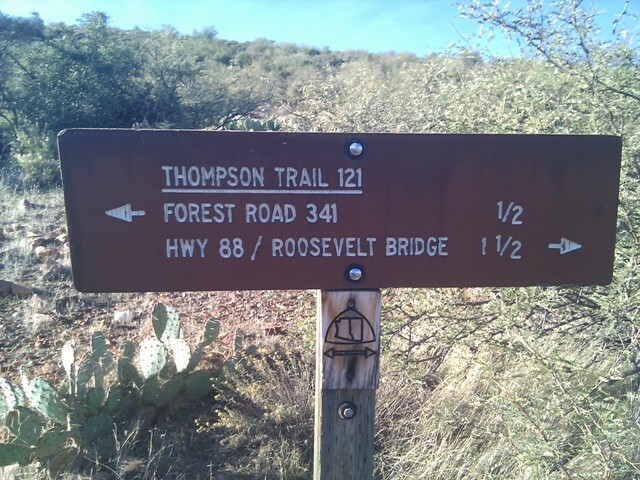 All while carrying 35 – 40 lbs in our backpacks on terrain the Arizona Trail Organization listed as Difficult. After about 8 miles we decided to setup camp for the night, from there “Sensei” Mike Armstrong (Blind Hiker) and Yancy Herriage (Sighted Guide) setup the tent while I (Ben Cane – Sighted Guide) setup our camp fire. After several hours of eating, resting, and debating whether Javelinas are a rodent or pig we decided to call it a night. After a good nights sleep we woke up at 6 am and were on the trail by sunrise, we pushed hard and shaved 2 hours off our original hike time finishing the day at about noon with a treat of pizza and wings. Overall this was a good training hike, when we first choose this location for our training hike we wanted to accomplish 2 things. 1. Figure out what a difficult rating really meant. 2. Get used to carrying heavier packs and learn to lighten the load a bit. We were able to accomplish both of those, after the first and second day I felt like I could go much further with the pack weight that I had; and we allocated 2 days to this section of the Arizona trail to make sure we have enough time for the difficult terrain. Below is the route we took on the first day. Also as a note, Yancy the Javelina has a closer relation to a pig than a rat according to Google/Wikipedia.